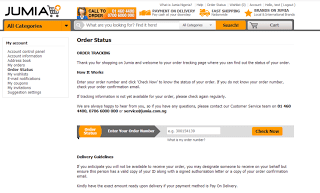 Jumia, Nigeria’s number one online retailer, has added order tracking function on the website. 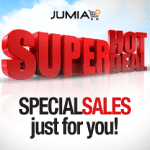 Customers of Jumia can now check the status of their orders on the website. Just visit Jumia Nigeria online store, log-in using your account detail and click on the Order Status link at the top section of the website. You will need the order number of the order to check the order status. 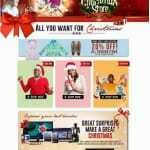 Lagos, Nigeria, September 2 – Jumia.com.ng, Nigeria’s number one online retailer after being nominated for the World Retail Awards, sets out to improve customer shopping experience. Today, Jumia announced the launch of an ‘order tracking tool’ on its website where customers can easily log in and check the status of their orders without having to call customer service. This new tracking tool will be available to all that place orders on jumia.com.ng. With the Innovation of the ‘order tracking tool’ it will bridge communication for the company with customers online; where they can follow up with the different stages of order processes, also with an estimated delivery time from status online. The new tool can easily be located on the header of the Website. You can directly access the Order Tracking Tool Here.